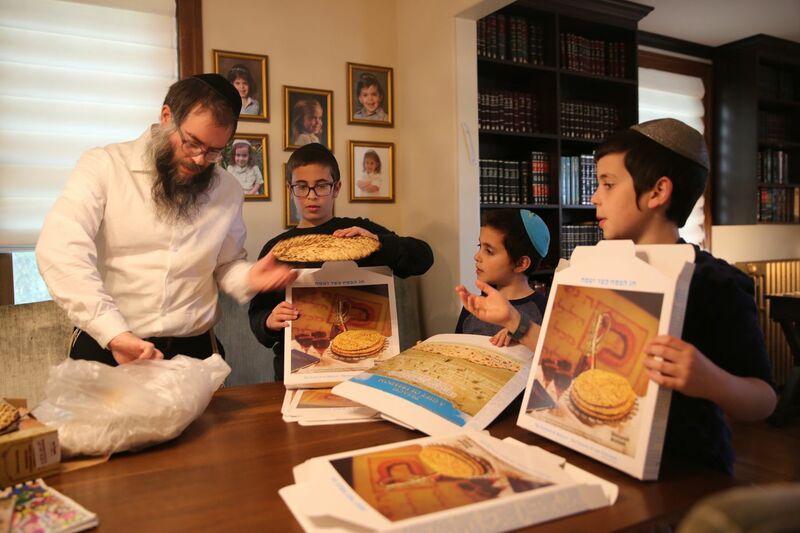 In preparation for Passover, Rabbi Yitzchok Kahan and three of his children (from left) Chaim, Levi, and Zev package matzo in their home in Medford to give to community members. The house sits back on a quiet street in Medford, Burlington County. Inside, there’s also a noticeable calm, amid a sense of joy and energy, too. What makes that remarkable is that this house is occupied by seven children — six boys and a girl — ranging in age from 8 months to 14 years. An older son lives at a yeshiva, a residential Jewish religious school, but returns for summer break. Although one might expect a high degree of mayhem in such a large household, Rabbi Yitzchok Kahan and his wife, Baily, maintain a kind of order not often found even in much smaller households. They’ve mastered the art of management, mingled with obvious love and affection for their polite, respectful children. Their approach comes from being part of the Chabad movement, which reaches back centuries to European roots and has as its basic goals to provide educational resources for Jews at all levels of observance and even nonobservance. The movement became noticeable in the United States in the 1940s. The Kahan family: (back row from left) Rabbi Yitzchok, Yosef, baby Henoch, and Baily, (front row from left) Levi, Chaim, Sara and Zev. They live near the Chabad Center in Medford. As Orthodox Jews, they observe the directive against driving on the Sabbath and holidays. When the family arrived in Medford in July 2003, they found a starter house in a small enclave. But when a Chabad Center was established in a building on Main Street, they found that the several-mile walk was not only difficult for their growing family, but also perilous. “Many of the streets here have no sidewalks,” Baily said. After a diligent search, the couple found a perfect home within easy walking distance of the center. The home was built in the mid-1920s and featured classic elements of the era, including abundant detail and wood trim. One of the first challenges was to create a kosher kitchen for the family, and another was to rethink the dining room space, because beyond their large family, the Kahans often host guests. By relocating a door in the original dining room, space for two tables became available. Rabbi Yitzchok Kahan works in his study near his extensive book collection. Rabbi Kahan also was able to carve out a space for his extensive book collection and for a study. “It’s not huge, but it’s the place where I can read and think and write,” said the rabbi, who, in Passover and other seasons, does a lot of those activities. Unlike many contemporary homes with children, this one doesn’t have even one television. “The kids do have access to some computer technology,” their mother said. “But they are living just fine minus TV. ... We get our news from other sources, and in fact, we feel lucky. It’s great to actually talk to one another." At this time of year, when the family prepares for and celebrates Passover, the kitchen is a hub of activity. “I love the kitchen because I could plan it to work for us and for our frequent guests,” said Baily, who incorporated a sassy black-and-white patterned floor, which is attractive and also maintenance-friendly. Sara Kahan holds her Haggadah booklet in the kitchen in preparation of Passover. The family uses Haggadahs illustrated by the children. Passover, observed with a ritual service and meal to recall the Exodus of the Jews from Egyptian tyranny, is particularly labor-intensive because it involves the clearing of all traces of chametz — anything with leavening — as a reminder of how quickly ancient Jews had to flee, even before dough could rise. The Kahan children — Yosef, 14, Chaim, 12, Zev, 10, Levi, 7, and Sara, 4 — said the holiday is very special for the family. On the first night, which is Friday this year, they share a community seder at the Chabad Center, housed in a Dutch Colonial building in downtown Medford. The second night is reserved for family, this year including baby Henoch, 8 months, and about 15 guests at the family home on Saturday. Adorning the home table will be Passover Haggadahs, the printed order of the holiday service, many of which have been illustrated by the children. When moving into their home, built in the 1920s, the Kahans had to create a kosher kitchen and expand the dining area. Traditionally, the Chabad rabbi and his wife distribute special round matzot to Chabad members and friends. It is a gesture that recalls the hasty exit of the Jews from their homes. Holidays have special meanings for families, even more so when celebrated in a home that has become a haven.